The morning after “Lailat Al Qadr” the death toll in Gaza was approaching its first thousand. I spent the holy night of “Al Qadr,” (The night before the last Friday of the holy month of Ramadan is a special night, believed to be the night when the Holy Koran was revealed to the prophet Mohammad) with friends in Ramallah, after participating in the 48K March for Gaza. 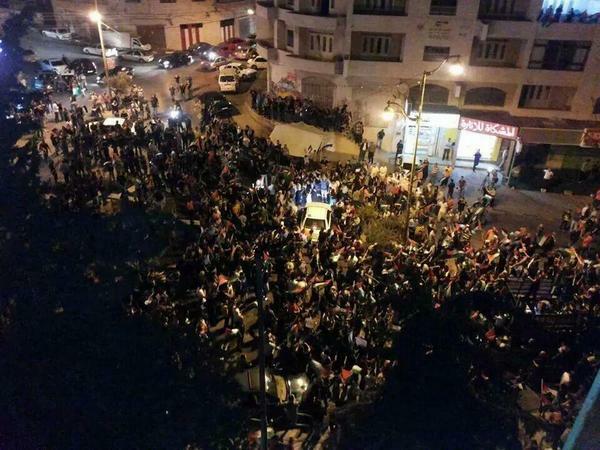 The march began in Ramallah and went to Qalandia checkpoint. What began as a peaceful event with families with children and even babies in strollers, ended with young Palestinians with gunshot wounds being rushed in ambulances to the local hospital. Qalandia crossing was fortified and air tight, and the Israeli soldiers stationed were shooting live ammunition at the crowd. As the ambulances were speeding through the crowd I couldn’t help wondering why there is no hospital between Qalandia and Ramallah, a good distance which includes the municipalities of Jerusalem, Al-Bire and Ramallah. The following night I was scheduled to leave Palestine to return to the US but Israeli forces sealed all the roads from Ramallah to Jerusalem for the night, and they were likely to be sealed the following day as well. At the crack of dawn, when things quieted down, my friend Samer drove me to a checkpoint that he suspected would be open. It was open, albeit for Israelis only, and from there I made my way back to Jerusalem. Listening to this I was reminded of Jewish communities under the Nazi regime who believed that if they cooperate and show they are good citizens then all will be well. But the road from cooperation to the concentration camps and then the gas chambers was a direct one. The Nazis would not have been able to kill millions of people if it were not for the naive belief held by the victims, that if one would cooperate and lay low things will be ok. The policies of racist discrimination and humiliation at Ben-Gurion airport, and the policies of ethnic cleansing and murder of Palestinians in Gaza, emanate from the same Zionist ideology. As we have seen over the past seven decades, cooperation and laying low do not make things ok. It is often said that Hitler was a monster. But hitler was not a monster, and any child will tell you that there are no such things as monsters. There are however many cruel people who get the support and cooperation of others in order to do unspeakable things. Hitler was not unique, the list of vicious, murderous men and women who as leaders of nations committed unspeakable crimes is too long to recount. But none of them could have done it without the cooperation of the victims and society in general. Cooperation with the Israeli authorities might lead to short term relief but it also validates Israel’s right to terrorize and humiliate Palestinians with our consent, “we” being all people of conscience. Whether we are Palestinian or not, the call of the hour is non-cooperation and resistance against the injustice. Today people lay the blame for the violence in Gaza on Hamas, but Israel did not start its assaults on the Gaza Strip when Hamas was established in the late 1980’s. 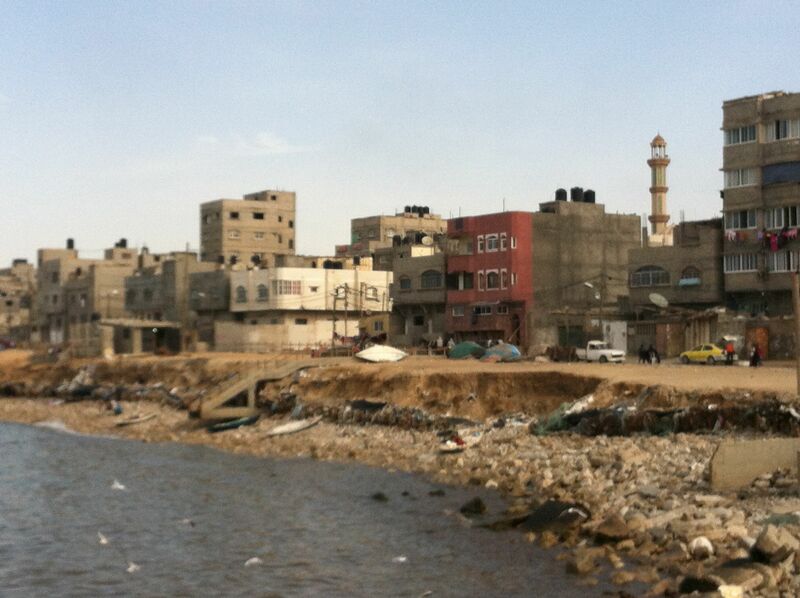 Israel began attacking Gaza when the Gaza Strip was established and populated with refugees in the early 1950’s. Palestinians, particularly in Gaza, are not faced with an option to resist and be killed or live in peace. They are presented with the options of being killed standing up and fighting or being killed sleeping in their beds. Gaza is being punished because Gaza is a constant reminder to Israel and the world of the original sin of the ethnic cleansing of Palestine and the creation of a so-called Jewish state. Even though Palestinian resistance has never presented a military threat to Israel, it has always been portrayed as an existential threat to Israel. 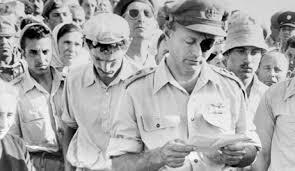 Moshe Dayan, the famed Israeli general with the eyepatch described this in a speech in April 1956. He spoke in Kibbutz Nahal Oz, an Israeli settlement on the border of the Gaza strip where Israeli tanks park each time there is a ground invasion of Gaza. Still, today, Israeli commanders and politicians say pretty much the same: Israel is destined to live by the sword and must strike Gaza whenever possible. Never mind the fact that Palestinians have never posed a military challenge, much less a threat to Israel. After all, Palestinians have never possessed as much as a tank, a war ship or a fighter jet, not to say a regular army. Israel is an illegitimate creation, born of the unholy union between racism and colonialism, and the refugees who make up the majority of the population in the Gaza Strip are a constant reminder of this. They are a reminder of the crime of ethnic cleansing upon which Israel was established. The poverty, lack of resources and lack of freedom stand in stark contrast to the abundance, freedom and power that exist in Israel and that rightfully belongs to Palestinians. Back at Ben-Gurion airport that night, I was told that if I cooperate and plead with the shift supervisor it would make the security screening go faster. When I declined this generous offer I was told they “did not like my attitude” and they proceeded to paste a sticker with the same bar code on my luggage and give me the same treatment Palestinians receive. As I write these words, the number of innocents murdered by Israel in Gaza has risen beyond two thousand. Ending the insufferable, brutal and racist regime that was created by the Zionists in Palestine is the call of our time. Criticizing Palestinian resistance is unconscionable. Israel must be subjected to boycott, divestment and sanctions. Israeli diplomats must be sent home in shame. Israeli leaders, and Israeli commanders traveling abroad must fear prosecution. And these measures are to be combined with disobedience, non-cooperation and uncompromising resistance. This and only this will show mothers, fathers and children in Gaza that the world cares and that “Never Again” is more than an empty promise.